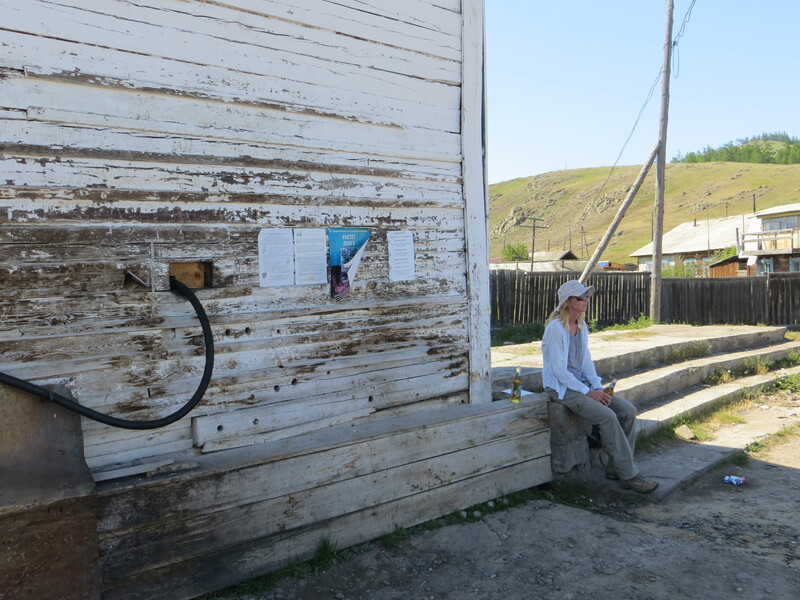 Mare and I seek some shade on the porch of a small store, in the remote fishing village of Baikalskoe, Siberia. 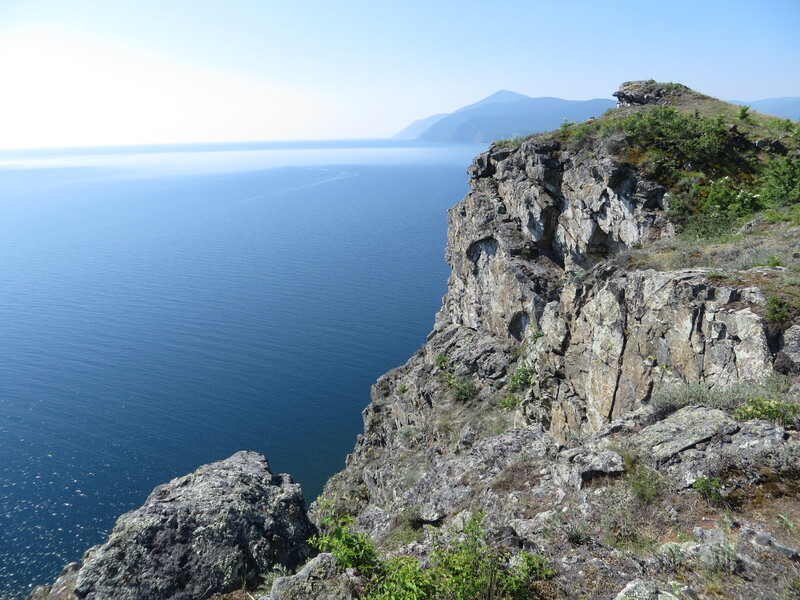 We are thirsty and exhausted from an exhilarating hike along the mountainous shore of magnificent Lake Baikal – the oldest (25 million years) and deepest (1600m/5,200 feet) lake in the world. 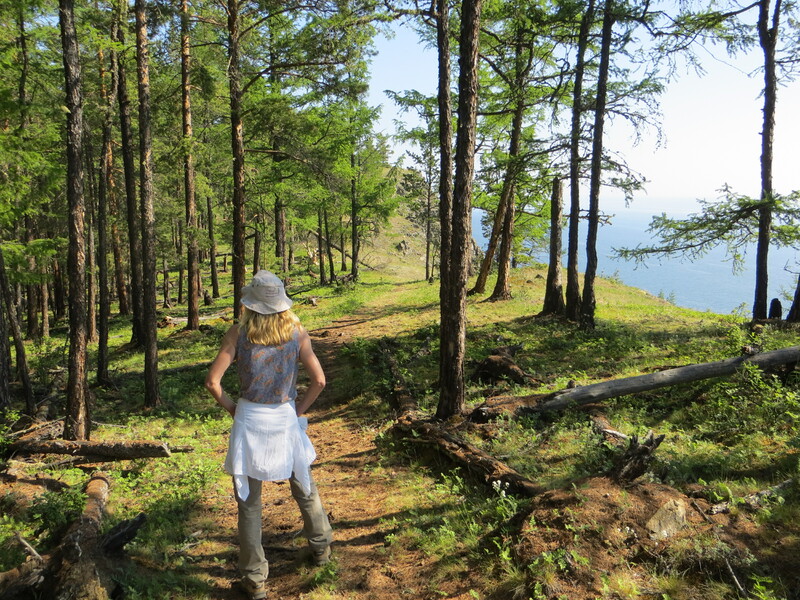 This portion of the Great Baikal Trail, which will one day circle 2,000 miles around the lake, twists through virgin forest, and onto steppe like slopes that disappear over craggy cliffs. Bays along the way appear Caribbean, as the visibility of this water is up to 42m/137 feet, but frigid, as the ice roads over the lake melted only one month ago. 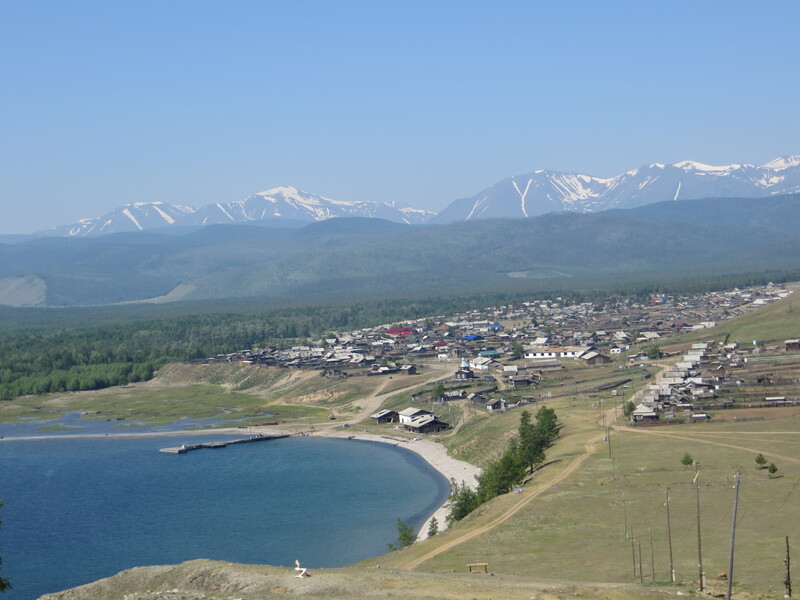 This peaceful 300 year old Siberian village was the only seal hunting and seal fur collective in the northern Baikal region. Today, fishing is the primary source of income for the fifty or so inhabitants. I gotta get Ron out of here! He smiles and lifts up his shirt, to reveal a full bottle of vodka in his pants. In an instant he secures glasses from the store, sits next to me on the floor and pours shots. Ah, my first taste of the Russian vodka ritual. You do not leave until the bottle is empty. He makes toasts in drunken Russian. I respond in inebriated English. Laughs sound the same in any language. Drinking half a bottle of Vodka could lead to a body hair contest? Mare takes me to the lake, for a sobering dip in the ice cold water…because we have a date for dinner…in a family’s house. 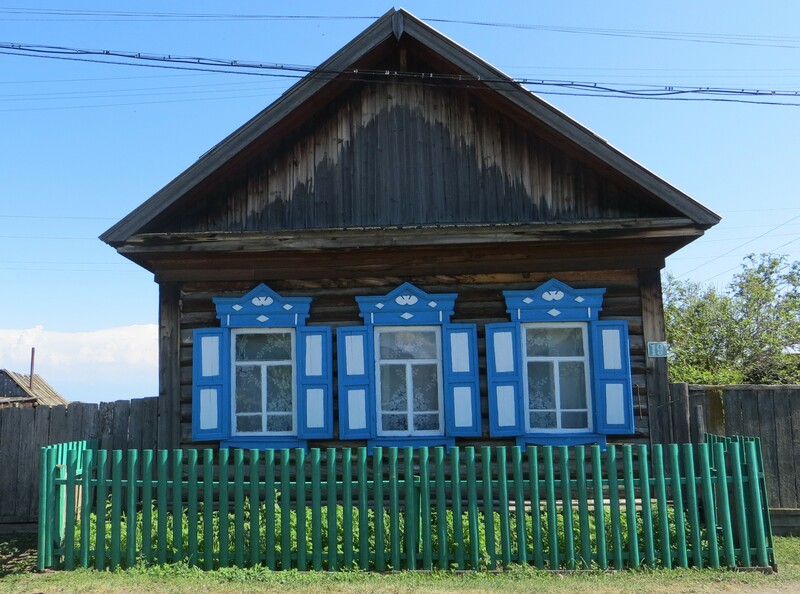 These wooden houses, made from logs and ornate trimmings, display traditional Russian architecture. All of them use blue or green as the primary accent color. We roam the dusty streets, dodging cows, in search of our dinner. “It has a green gate,” Mare says. “They all have green gates!” I respond. 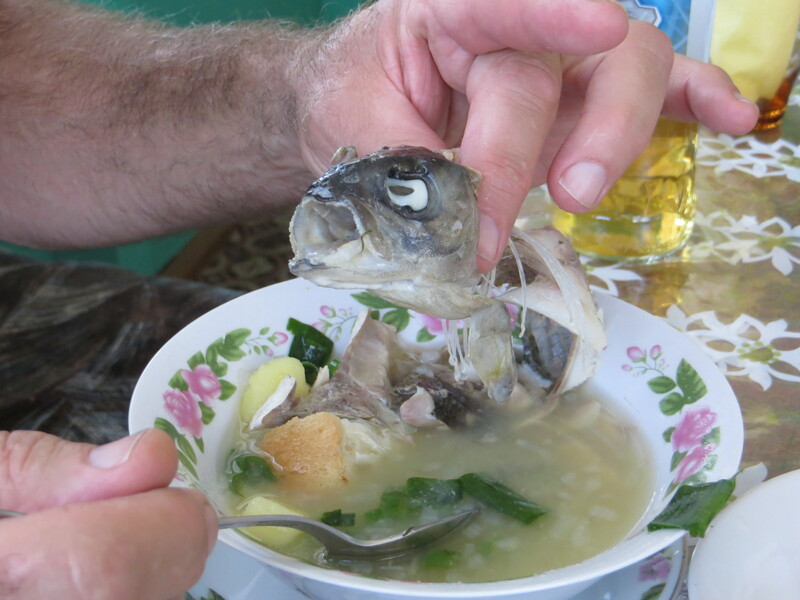 Grandma Gertrude flags us down, and serves delicious fish soup, with fish and rice stuffed rolls. Dinner is topped with tea and wild blueberry tarts. Sweat pours from us, as we eat hot soup in this hot house with no running water. We have discovered warm, friendly, hospitable people, beneath that cold Russian veneer. Strangers help us at bus stations, folks invite us into their homes for food, and we have witnessed neither violence nor hatred. 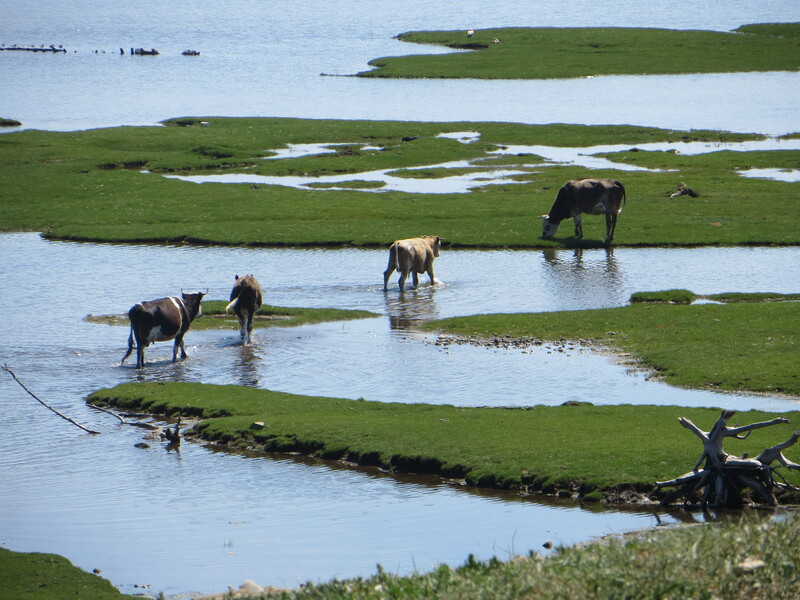 We’re glad to have jumped off the Trans-Siberian RR, and onto the BAM (Baikal-Amur Mainline) RR in order to explore Northern Lake Baikal. Our gracious hosts, the lovely Anna and the very smart Misha! What a vast and Beautiful place. A far simpler life that looks as if it hasn’t changed in hundreds of years…still eating “Fish Head Soup” How did you ever get a photo of two Russia Bears…do they always show the fur on their stomach during mating season. Carl, usually show fir after Vodka…mating much more complicated! Beautiful. It’s lovely that you find people who will take care of you all over the world. This is what the Dalai Lama has tried to tell us. Thanks for sharing. Ann, we find that to be true in most places. So many folks (with good intentions) told us how afraid they were that we were traveling in Russia. Misguided perceptions of fear do not lead to good things. I hear that Mongolia is even more hospitable. We will see in a few days! I am soooooo loving this! You would love being here, Marti! What a sign of unity between people…you two are our best ambassadors. Larry, I think that we do okay, stumbling around…we are all the same when you get down to it. Mary Anne, you were on that porch, drinking Vodka with us! It is beautiful to see how loving and caring all people basically are deep within. It is heartwarming. Hey Ma and Pa, yes…once we get over our awkwardness and engage with people, the warmth comes out naturally. Sounds like a fun and interesting place. Stay well and keep us updated. This has made me think I might put it on my bucket list. It is my most favoured place in all the world and your photos are masterpieces. I am not sure I could eat a whole fish in a bowl of soup and hope they have sauerkraut soup as an option. I worry I will not be safe there but it looks as if there is no where safer. I hope the Lake is protected as we do not want it ruined like the Aral Sea or someone putting a giant straw into it to bottle its water. Also if one took the train one could bring a lot of things to the schools, like books etc. Would that be acceptable or is the internet now the only thing that is needed? You are both very brave people. Thank you for your kind words, Sandy. don’t worry, they serve borscht soup everywhere and it’s delicious, if you like beets! There is a lot of movement to protect the lake, but then again, Russian leaders can pretty much do what they want. Folks do not have very many things in rural areas, and I would guess that any gift would be appreciated. The train offered several days of relief from some fairly difficult travel, I say difficult only because of our total lack of understanding the Russian language. In terms of safety, we never felt threatened in any manner. Be aware of your luggage as you normally would, and the main nuisance would most likely come in the form of a vodka-ridden Russian man! We have a dream to take the Trans-Siberian from the eastern border during winter to see Lake Baikal iced. Check out some internet photos of the lake during winter and you’ll know what I mean. We may have to hit the lottery to fund that one, though! Killer photos Ron! here is my Baikal story … Dangerous Trekking Around Lake Baikal- the world’s largest body of fresh water hope you enjoy my pics and story man. Cheers! How peaceful this village must be. Were the evenings long or short at the time you were there? Ron, do you and Marilyn play chess? Living in this latitude, I can imagine the endless patience people develop. Meantime, on this side of the planet, I’ve been reading the poetry of Robert Lowell. I cannot explain how reading about your visit to the Baikal and reading Lowell leads me to ask you, do you think that History us like Hoarding? Man, the places you guys have visited. Un abrazo. Marilynn won’t play chess because she has never beaten me. In my view, history is more curiosity, that can become hoarding for some who don’t want to let go.